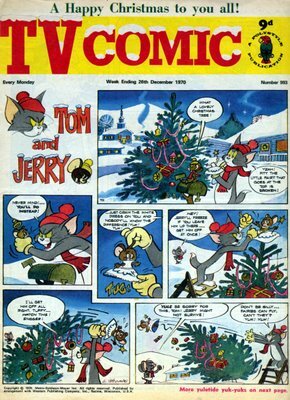 It started with a Tom and Jerry strip on the front, one which concluded on the back – good for a chortle but nowhere near as funny as the actual cartoons. Inside, there were strips of other cartoons too, like Roobarb and Barney Bear – although, I confess, I don’t recall ever seeing a Barney Bear TV cartoon in my puff. Bizarrely for a child’s magazine, it had also had strips of more adult-orientated programmes like Dad’s Army and, most peculiarly, Cannon, an American drama series (a good old Quinn Martin production) about an overweight private detective, played by William Conrad (later to appear as guess-which-one in Jake and the Fatman). I’m not sure I ever read those, although that’s partly why I regret that I donated all my copies to the local doctor’s surgery. Another reason for such regret was that there was a Doctor Who serial strip near the back of the magazine – this was what made it an absolute must-read-before-school-and-discuss-with-classmates. Tom Baker was the incumbent Doctor at the time, easily the most popular Doctor of the original series, and I well remember the excitement of those final-box cliff-hangers, especially when the programme had finished for the summer. “Interestingly” enough, all was not lost to the doctor’s surgery waiting room: most, if not all, of TV Comic’s Doctor Who strips were reprinted during the 1990s in the Marvel publication Doctor Who Classic Comics – I actually collected all of those too. See, good things come to those who wait, patiently, with a carrier bag. Blimey, it’s hot inside this old parka. I received deliveries of TV Comic for about two years – not long by the standards of a man in his forties, but it was an age when I was a child. And with age came more exciting magazines. This entry was posted on August 3, 2010 at 10:50 pm and is filed under Favourite Publications, Geeks, TV. You can follow any responses to this entry through the RSS 2.0 feed. You can leave a response, or trackback from your own site. Ah bless… Remember the experience well. Think mine used to turn up on Thursdays too, even though I lived in Manchester. Who were these kids who got it on a Monday? Anyway, for me it was the Beano and Whizzer & Chips. Who can forget that thrill of hearing the letterbox rattle followed by a gentle plop of a crisp new comic.